Find a Christmas & New Year trip that explores Grampians National Park. There are 20 tours to choose from, that range in length from 3 days up to 28 days. The most popular month for these tours is September, which has the most tour departures. "Great tour! We stopped often and saw many amazing spots along the way. Carla went..."
"Overall it is a very good tour. it was fun to travel with a bunch of young people..."
"I really like and recommend this tour. We had only 5ppl. Covered soo much! Beautiful..."
"Enjoyed the tour. Robert was a good guide...very knowledgeable." 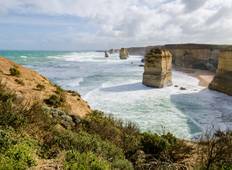 "The scenic route along the Great Ocean Road was beautiful. We were given sufficient..."
"Most amazing experience ever! Everything was organised so well and the tour guides..."
"Darren the driver/ guide was excellent. The itinerary was good. Bus was not the most..."
"A great tour all around, majestic views of the Great Ocean Road and the Grampians!..."